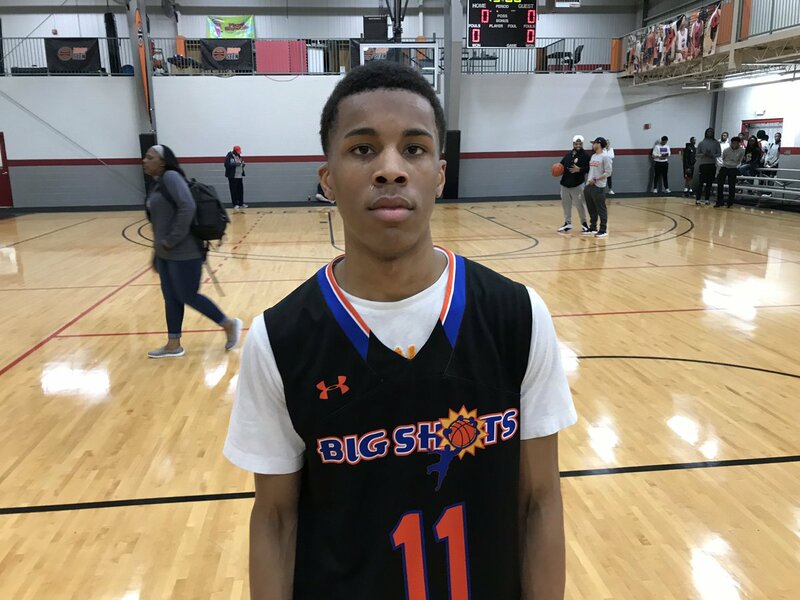 2020 6-0 PG Roman Son (Therrell): The state champion picked up where he left off at Therrell using his blinding speed to blow past some of the most highly sought-after prospects in Georgia en route to 20 points, 4 rebounds, 2 assists and 3 steals in a 78-74 win over Game Elite. Son is a floor general and vocal leader not shy to bark out orders. He knocked down a few pull-up jumpers in the lane – a good sign – but his overall shooting outside of 15-feet is still a heavy work in progress. He went 2-10 from the line, missing three late free throws. 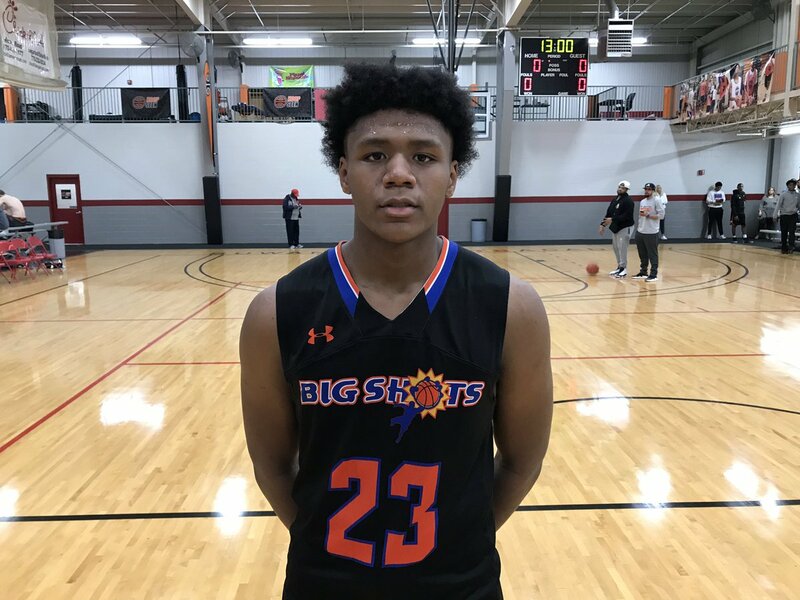 Son has the intangibles to be considered a top 10-15 point guard in the 2020 class for Georgia, but to fully cement himself as a top dog he will need to get up as many shots as possible to shore up his one offensive weakness. 2020 6-4 SG Chris Youngblood (East Coweta): East Coweta’s climb from nearly worst to first in Region 2-AAAAAAA was well-documented this season. Youngblood’s perimeter prowess and strong frame have made college coaches take note. Coming off of a GACA All-Star Game MVP performance, Youngblood was locked in again dropping 26 points (3 threes), 2 rebounds, 1 assist and 1 block. At first glance, Youngblood has a stocky frame but it’s a college-ready build that’s equipped for the rigors of the next level, especially once he gets into a college weight room and tones up. He isn’t super long, but his understanding of how to defend helps him block shots when attacked. Youngblood is sneaky athletic and with his size, can post up smaller defenders and punish them inside. 2020 6-3 G/F Kirshon Thrash (Eagle’s Landing): Since seeing him last summer at Georgia State Team Camp, Kirshon Thrash has slowly begun to grow on me. His uniqueness and physicality make him a jack-of-all-trades at the high school level. Standing 6-foot-3, Thrash plays at the guard position but honestly could play 1 through 4 with his strength allowing him to defend multiple positions. Much like Youngblood, Thrash is a bully on the low block when needed but what separates him from most guards in his class is his outright productivity all over the floor. 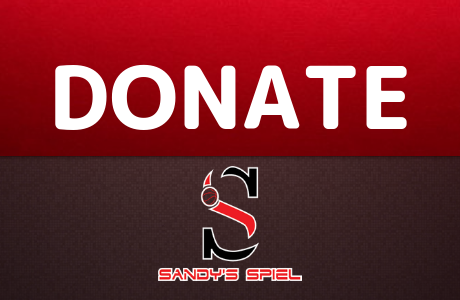 Thrash is an exceptional passer that riffles assists into tight quarters. His powerful build makes him a menace on the glass and defensively, he seems to always have his hands on loose balls. Against Game Elite he tallied 11 points, 6 rebounds, 4 assists and 3 steals. If Thrash is able to add a consistent three-point shot to his arsenal, expect the human wrecking ball to be even tougher to stop offensively. 2020 6-6 F Sam Hines (Wheeler): Sam Hines might not ever be the “best” player on his team but he will always be the most reliable. Transferring from St. Francis to Wheeler cost him a state championship but Hines was able to prove that he could produce no matter the competition level. Hines is more steak than sizzle, always positively affecting games while teammates garner the headlines. He was terrific in Game Elite’s loss to the Georgia Knights, posting 19 points, 9 rebounds and 1 assist. Hines simply knows how to play the game and understands what he is best at. He can hit the occasional three, but he is most adept at working from 15-feet and in and pounding the glass. You never have to question his motor or his willingness to compete. Named Class 7A Most Underrated, Hines shined again. He should be in play at the Mid-Major level and should excel as a low maintenance energy glue-guy. 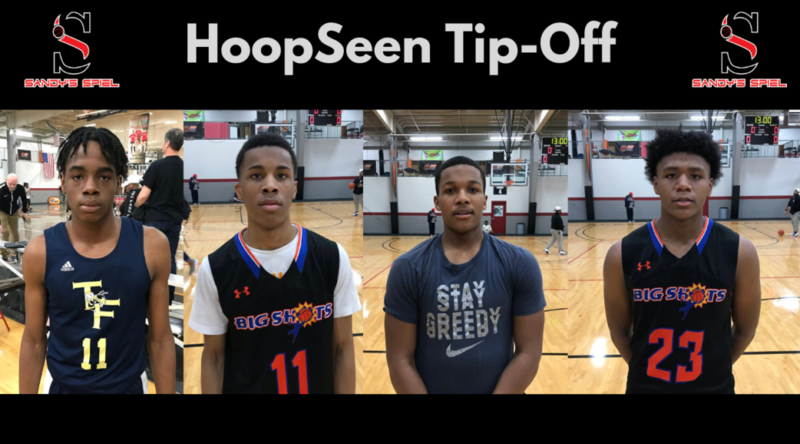 2020 6-5 W Trashawn Wilson (New Manchester): The biggest stock riser from the HoopSeen Tip-Off had to be Trashawn Wilson from New Manchester. The Jaguars were the most talented 11-16 team in the state last year and having Wilson as a fourth leading scorer is something most coaches in the state would dream of. Wilson had a big game in Team Forrest’s 69-68 OT win over AC Georgia, scoring 22 points, grabbing 5 rebounds and snatching 2 steals. The 6-foot-5 wing was smooth, hitting jumpers all over the floor while also attacking the rim and finishing 5-5 from the line. His And-1 jumper in OT sealed the win. Going from unknown to head-turner, Wilson left me wanting to see more and that’s definitely a good thing. 2020 6-10 C Christian Fussell (Greenforest): Fussell has bounced from school to school over his first three seasons but the big man has still found time to work on his game. He’s an intriguing prospect no doubt, especially with his ability to step out and shoot the three. He nailed four deep balls on his way to 18 points, 11 rebounds, 2 steals and 1 block. Fussell didn’t show much of a feel for scoring with his back to the basket and is a true stretch-big. As he continues to get reps and opportunities to show what he can do, his recruitment will be one of the more interesting storylines to unfold. 2020 6-6 F Melvin Edwards (Carrollton): After first laying eyes on Melvin Edwards last June, there was no questioning his upside. After watching his play this weekend, I think it’s time to seriously consider the Carrollton Trojan as a potential D-I prospect. Edwards has the athleticism coming off winning the West Georgia All-Star Game Dunk Contest but that’s just the tip of the iceberg. He can shoot the ball from deep, he can put it on the floor and finish in traffic and he can protect the rim when asked. He put together a strong game against AC Georgia with 17 points (5-5 FT), 7 rebounds and 1 assist. Edwards is trending in the right direction and needs to be tracked by college programs. 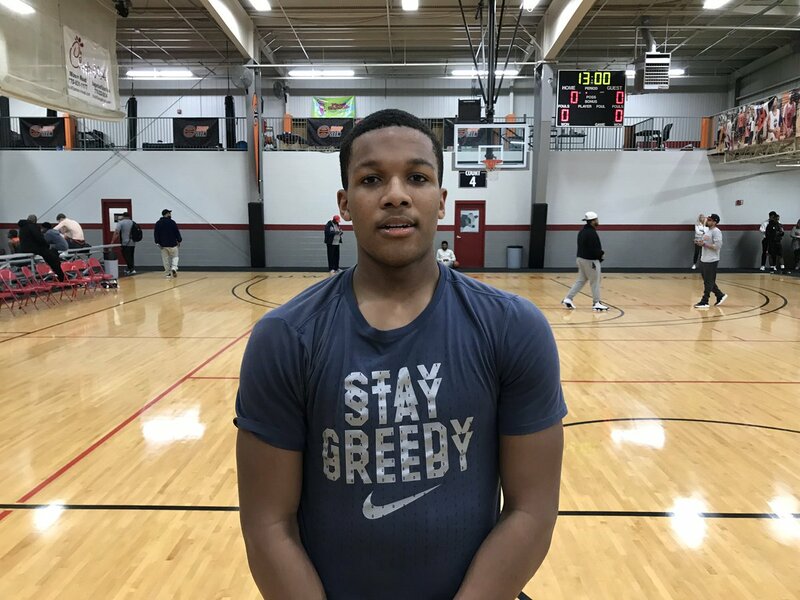 2020 6-5 PF Adonnis Tolbert (Denmark): Adonnis Tolbert is a sturdy and strong athlete that puts the power in power forward. He brings his football toughness to the hardwood and knows how to use his body. He has a strong vertical explosion when finishing strong in the paint and has a very trusty mid-range jump shot. Tolbert had 14 points, 3 rebounds, 1 steal and 1 block in a 69-68 OT loss to Team Forrest. After bursting onto the scene last year, sweeping the then defending state champion South Atlanta Hornets in three games by a total of 15 points, Therrell has returned to prove that last year’s Elite Eight finish was no fluke. Hit with the transfer bug, losing leading scorer to DeAndre Brown to Holy Spirit Prep, No. 2 Therrell (7-3) has proven they can push through adversity and did so again on Tuesday night, handing No. 4 South Atlanta (9-1) its first loss of the season in front of a spirited home crowd without the services of 6-foot-5 All-State power forward Robbie Armbrester. Short-handed without their star post presence, the Panthers needed someone to step up especially once the Hornets came out of the gates hot, stinging Therrell with a quick 8-2 spurt paced by 6-foot-3 junior shooting guard Ja’Quavian Florence, who turned defense into offense with eight points and four steals in the opening eight minutes. Therrell caught their breath and regrouped early behind Tyrese Ransom. The junior guard slithered to the hoop to trim the lead to two. At the end of one, South Atlanta held a 14-11 advantage. 6-foot-5 junior swingman Ra’Sean Frederick scored 11 of his team-high 19 points in the first half and knocked down a three to knot the game at 14 just over a minute into the second quarter. Defense and physical play set the tone right away for both teams as neither could take ahold of the lead for good. 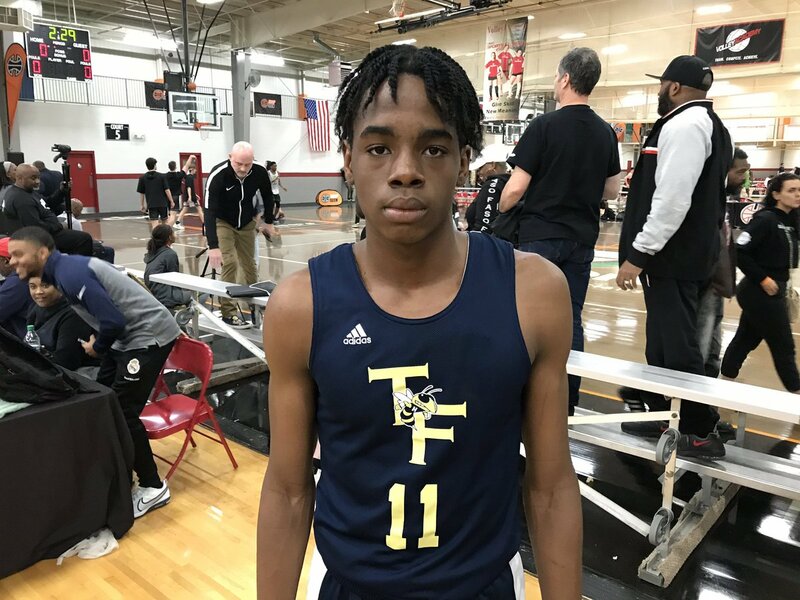 South Atlanta’s 2-3 zone slowed down Therrell’s attack but Cameron Fortson muscled his way to six points in the quarter to become a factor while Florence continued to shine for the Hornets, knocking down a pair of triples as the Region 6 rivals went into the half tied at 26. Points were hard to come by in the third quarter as after a Gary Davis layup at the 4:09 mark, the score remained Therrell 32 and South Atlanta 31 until 2:28 left to play. The pace soon quickened as Florence struck again with his defense, pilfering and putting down a fast break jam to ignite the South Atlanta crowd and move the Hornets ahead 37-36 with 1:01 remaining. The Panthers answered however behind Preseason All-State point guard Roman Son, who had been quiet up until the waning moments of the third. Son attacked the basket and finished a late layup that gave Therrell a 38-37 lead heading into the fourth quarter. Ransom extended the Panther lead to 43-39 at the 6:03 mark after converting an And-1. The Hornets responded by moving to a full court press to try and change the pace. The move worked as Florence sparked a 7-2 run to take a 48-45 lead with 3:17 remaining as he found Rohan Garner in the corner for a three-pointer then collected another steal and went coast-to-coast for an And-1, but missed his free throw attempt. With Georgia State and Columbus State in attendance, the Lakers already offering, Son kicked it into high-gear and seemed to thrive in crunch time. Though he only scored seven points on the night, the true point guard made two of the biggest plays down the stretch, spoon-feeding Ransom for a layup and then Frederick to take a 49-48 lead before Florence answered with a layup and Frederick later was sent to the line to split a pair of free throws, leaving the game squared at 50 with 1:30 left. No. 2 @APSTherrell 50@_king_r0 squeezes in assists to Tyrese Ransom then @SeanF_2, but @JaquavianF answers with a layup. South Atlanta had opportunities down the stretch but failed to capitalize. 6-foot-6 sophomore forward Julius Lymon raced down the floor and pulled up from 15-feet, missing the shot and going over the back to send Ransom to the line where he sank a pair of free throws to give Therrell a 52-50 lead with 43 seconds to play. Now down two, the Hornets found the ball in the hands of freshman guard John Lawton who felt pressure in the corner and threw the ball away to Frederick before Corey Donaldson was fouled and sent to the line with 21.2 seconds remaining. Donaldson left the door open by splitting a pair of free throws. Florence got a clean look at the other end and missed, but got his rebound and had the ball knocked away with 6.5 seconds. On the ensuing inbound, the Hornets had to settle for a Demetrius Headspeth layup with 2.5 seconds left on the clock making it 53-52. It looked like Therrell was able to run out the clock before being fouled but South Atlanta was gifted 1.8 seconds and saw Frederick head back to the line. Frederick sank his first attempt but missed the second. Gary Davis rebounded and heaved the full length of the court but there was no South Atlanta miracle to be had, Therrell surviving 54-52. It’s always a classic when these two premier Class AA schools meet. Therrell was up against it without double-double machine Robbie Armbrester available to play but as all good teams do, the Panthers had key role players step up. Tyrese Ransom netted 14 points while getting the start. The lefty found himself at the right place at the right time and scored half his points in the fourth quarter including going 3-for-3 from the line. 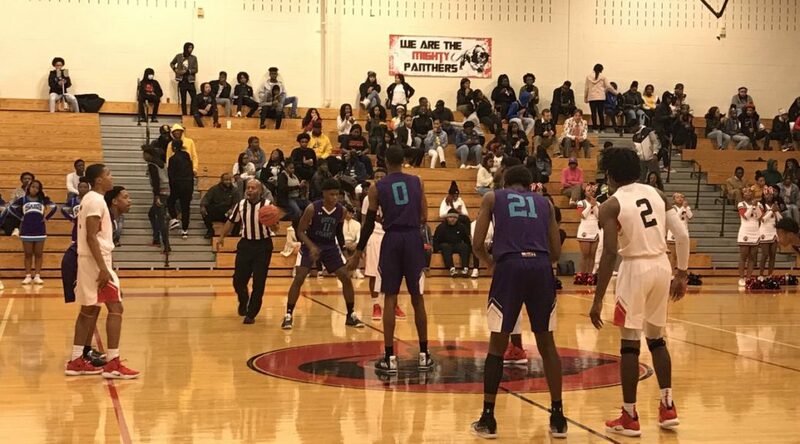 Three-point shooting could be an achilles heel for the Panthers and South Atlanta made life tough for them by sitting in a 2-3 zone and with enough size inside to protect the rim and outrebound the Panthers 37 to 23. Therrell hit three deep balls on the night, getting two from Ra’Sean Frederick who has taken his game to the next level now that his role has increased after the loss of DeAndre Brown to Holy Spirit Prep. Frederick is a big 6-foot-5 southpaw that affects the game in many ways with his physicality. His three-point shot is a little flat but it goes in and his willingness to mix it up on the glass gives Coach Eddie Johnson another imposing force when crashing the boards. Roman Son had a quiet game offensively, but his spurt in the last two minutes helped the Panthers settle themselves and regain momentum. His quickness, toughness, ability to both find the open man and finish through contact will translate well to the next level, but to really solidify himself as one of the premier guards in a deep 2020 class, he will have to craft a three-point shot that will keep defenses honest and stretch them out to create even more lanes for scoring and assisting. South Atlanta had opportunities all night to steal a massive Region 6 road win but could not seal the deal. There were silver linings in the loss however as Ja’Quavian Florence was outstanding, finishing with 24 points, 7 rebounds, 3 assists, 6 steals and 1 block after promising me before the game that he would put on a show – he did just that. If you follow Sandy’s Spiel year-round, you’d know that Florence was a name I tabbed back in June and its quite refreshing to see him rise to the occasion in a big spot. While his athleticism and scoring are easy to notice, it was his quick hands on defense that really separated him tonight. Florence is rounding into a nice prospect that could garner some D-II/LM D-I sniffs come his senior year. 6-foot-6 sophomore Julius Lymon had a wasted freshman campaign after breaking his wrist and enduring an essential redshirt season. He had some hype coming into last year but will have to work hard to remind people about his potential. He didn’t have a massive game and did have a poor decision down the stretch, but there’s a lot to like about his frame and mobility. He collected 10 rebounds and keeps the ball high on putbacks. He also swatted away four shots. Going from someone who had steam going into their freshman year to a player that no one has talked about, 5-foot-11 freshman point guard John Lawton has some promise. Much like Lymon, he showed his youth late in crunch time, but you can’t teach Lawton’s toughness and aggressive on-ball defense. While he can get a little too chippy on defense, if you’re being defended by Lawton you will know it. He did not back down from the challenge of checking Roman Son and got right in his chest, flustering Son into committing an offensive foul with a shoulder. Lawton has some bounce for a freshman and quickness to get into the paint where he dropped off a few nice passes. He will have some freshmen moments, but the good will outweigh the bad this season and Lawton could be a sneaky name to track for the next four years and could be next in the long line of quality guards that Coach Michael Reddick has helped produce.